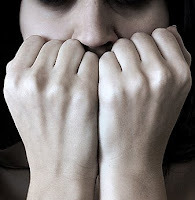 Nursing Diagnosis Anxiety must be different from fear, At Nursing Diagnosis Anxiety nurse helps the patient identify the causes of Anxiety, or when it cannot be identified nurse will help patients to express Anxiety. While in the diagnosis fear, the nurse will move the cause of fear or overcome a specific fear. Vague uneasy feeling of discomfort or dread accompanied by an autonomic response (the source often nonspecific or unknown to the individual); a feeling of apprehension caused by anticipation of danger. It is an alerting signal that warns of impending danger and enables the individual to take measures to deal with threat. • Appear relaxed and report anxiety is reduced to a manageable level. • Verbalize awareness of feelings of anxiety. • Identify healthy ways to deal with and express anxiety. • Use resources/support systems effectively.